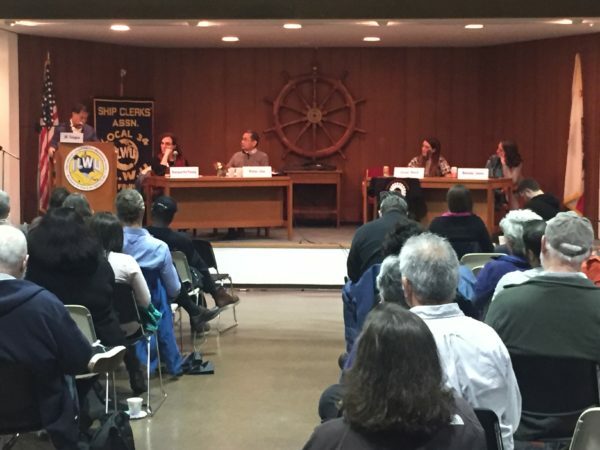 Union members and climate activists gathered for a discussion on Climate Change and Labor: Challenges and Opportunities in 2018 at the International Longshore and Warehouse Union (ILWU) Local 34 abutting AT&T Park in San Francisco. Moderated by Blue Green Alliance West Coast Director JB Tengco with audience Q&A, the 90-minute meeting fostered agreement on the need to address climate change and union interest in becoming more green if the jobs are there. “Our members are deeply affected by climate change,” said Victor Uno, business manager for the International Brotherhood of Electrical Workers (IBEW) Local 565 covering Alameda, San Joaquin and Calaveras counties with some 2,000 workers. The union is among first responders when disaster strikes and during Katrina IBEW workers helped re-build the 9th Ward, he said. Uno noted that carbon emissions are compounded by fires. According to a national study, fire emissions of CO2 in the US equals to 4 to 6 percent to of human-generated emissions but at the state-level sometimes exceed annual emissions from fossil fuel usage. “Climate change is reaching into our own households now,” Uno said. “How are you going to retrofit to lower our carbon footprint?” Uno emphasized the importance of creating good jobs. “Good jobs are only if you have a good union,” he said. “Get involved and get good policy.” A founding member of the Asian Pacific American Labor Alliance (APALA), Uno recognized a Japanese labor leader in the audience and remarked that the meeting was international. UC Berkeley Climate and Jobs Research Specialist Betony Jones emphasized working together to change the status quo and creating job policy to generate good job outcomes. Former director of the Green Economy Program at UC Berkeley Labor Center, Jones led research projects on the economic and employment impacts of California’s climate policies and her work has been used to support passage of climate policies and ensure better outcomes for workers. “In California we are on track and will meet our 2020 goals,” Jones said of the state’s Renewable Portfolio Standard. “It’s been a promising story. Careful, thoughtful planning made it happen.” Such planning is needed for the labor sector and a focus of The Labor Center Green Economy Program. Jones noted the benefits of better wages and the important role that labor plays in keeping us on track on climate policy. Risks of job loss include refineries (Steel workers, building trades), utilities (IBEW, utility workers), and construction trades, Teamsters, and ILWU. Unions already are addressing climate issues. The Zero Net Energy Center in San Leandro offers electrical training for sustainable careers in a project owned and financed by the IBEW Local 565 and the National Electrical Contractors Association (NECA) Northern California Chapter. The unions also closely follow legislation. The meeting was sponsored by the League of Women Voters of Berkeley, Albany, and Emeryville and Citizens’ Climate Lobby Chapters from Alameda, Contra Costa and San Francisco.